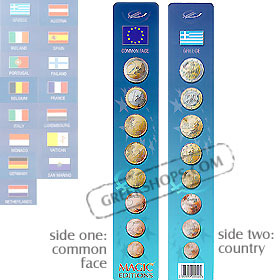 A beautiful plastic-coated bookmark displaying the common face of the Euro coins. SIDE 1: Features the euro coins from the country of your choosing. Pick from Greece, Austria, Belgium, France, Ireland, Spain, Italy, Luxembourg, Netherlands, Portugal, Finland, Monaco, Vatican, and San Marino. Each of the 8 sizes/values of coins are displayed, along with the country's flag. SIDE 2: Features the common face of the Euro coins used throughout the world. The perfect gift for a coin collector! A handsome match with the Euro Coin Poster!